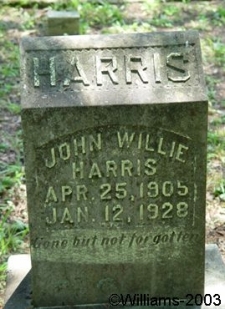 John Willie Harris, son of Jim Harris and Lucy Knight. Mr. J.W. Harris, a well-known citizen of the county, last Thursday suffered very near the identical fate that befell his father almost twenty-two years ago. Mr. Harris was working at a small mine operated by himself and two uncles, Messrs. J.A. and Joe Knight. On January 12th, Messrs. Harris and Luther Knight were at work near an ore derrick, when a great bank of dirt began sliding at so rapid a rate that Mr. Harris could not get out of its path, killing him instantly. Mr. Jim Harris, father of J.W. Harris, was killed 22 years ago at the Morgan mine. 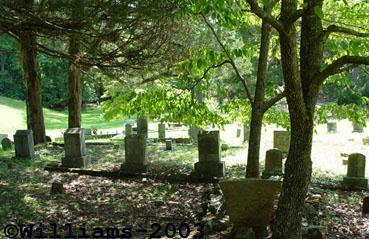 Mr. Harris leaves to mourn his loss his young wife, who was before her marriage, Miss Mildred Guyton, to whom he was married in Mary of 1927; his mother Mrs. Lucy Crisp, his grandmother, Mrs. J.M. Knight, of near Cartersville, and a grandfather Mr. Jim Harris. The sympathy of the friends of the family go out to them in their bereavement. Funeral services were conducted at Macedonia church. Revs Sheffield and Bennett officiating; John W. Jones in charge of funeral arrangements.